A star is a hot, roughly spherical ball of gas that shines as a result of nuclear fusion reactions in its core. 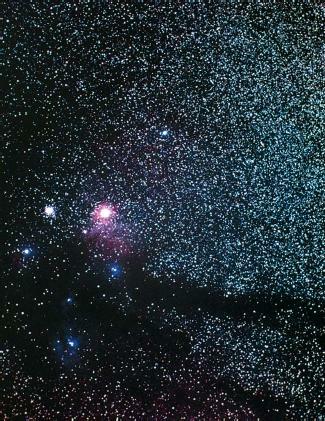 Stars are one of the fundamental objects in the universe. Stars—and indeed the entire universe—are made mostly of hydrogen, the simplest and lightest element. By contrast, our bodies are composed of many complex elements, such as carbon, nitrogen, calcium, and iron. These elements are created in the cores of stars, and the final act in the lives of many stars is a massive explosion that distributes the elements it has created into the galaxy. Eventually these elements may form another star, or a planet, or life on that planet. Stars are born in the interstellar medium, the region of space between stars. Drifting through this region are vast, dark clouds of gas and dust. Certain celestial events, like the nearby explosion of a massive star at the end of its life (supernova), cause these clouds to begin to contract. After a supernova, a shock wave sweeps through the interstellar medium. When it slams into the cloud, the gas and dust is violently compressed by the shock. As the particles are squeezed together, their mutual gravitational attraction grows and a blob of gas forms, giving off energy. As the temperature in a contracting blob of gas becomes higher, the gas exerts a pressure that counteracts the inward force of gravity. At this point, perhaps millions of years after the shock wave slammed into the dark cloud, the contraction stops. If the blob of gas has become hot enough at its center to begin thermonuclear fusion of hydrogen into helium, it has become a star. It will remain in this stable state for millions or billions of years. An interstellar cloud does not always have to be disturbed by a shock wave to form stars, however. Sometimes a cloud may be hot and dense enough to break up and contract spontaneously under its own gravity. Large clouds can break up into numerous cloudlets this way, and this process leads to the formation of star clusters—groups of stars close to each other in space. Often, two stars will form very close to one another, orbiting around a common center of gravity. This two-star system is called a binary star. Both star clusters and binary stars are more common than single stars. Binary star: Double-star system in which two stars orbit each other around a central point of gravity. Black hole: Remains of a massive star that has burned out its nuclear fuel and collapsed under tremendous gravitational force into a single point of infinite mass and gravity. Core: The central region of a star, where thermonuclear fusion reactions take place that produce the energy necessary for the star to support itself against its own gravity. Interstellar medium: Space between the stars, consisting mainly of empty space with a very small concentration of gas atoms and tiny solid particles. Neutron star: Extremely dense, compact, neutron-filled remains of a star following a supernova. Nuclear fusion: Merging of two or more hydrogen nuclei into one helium nucleus, accompanied by a tremendous release of energy. Pulsar: Rapidly spinning, blinking neutron star. Star cluster: Groups of stars close to each other in space that appear to have roughly similar characteristics and, therefore, a common origin. Supernova: Explosion of a massive star at the end of is lifetime, causing it to shine more brightly than the rest of the stars in the galaxy put together. White dwarf: Cooling, shrunken core remaining after an average-sized star ceases to burn. information to know that such collisions are not uncommon within dense clusters of stars. These new stars, called "blue stars," contain more hydrogen than smaller stars, but burn hotter and burn out more quickly. They result from the collision of two (or even three) small, old stars in globular clusters (a tight cluster of tens of thousands to one million very old stars). Astronomers estimate that several hundred such collisions occur every hour. With 100 billion galaxies in the observable universe and each galaxy containing an average of 30 globular clusters, most of the collisions occur far away from the Earth. Over the lifetime (about 10 billion years) of our home galaxy, the Milky Way, astronomers believe there have been at least 1 million collisions within its globular clusters, or about 1 every 10,000 years. been maintaining this rate of fuel consumption for five billion years—and will continue to do so for another five billion years. In the majority of stars, the energy created at the core is carried close to the surface by slow-moving gas currents. As these currents or cells reach the surface atmosphere, they release this energy, which is radiated into space as visible light and other forms of radiation of the electromagnetic spectrum. Once cooled, the currents fall back toward the core where they become heated and rise once again. This organized churning is called convection. 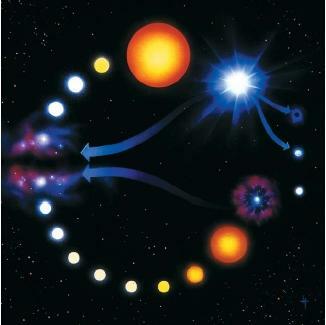 A star's mass (the total amount of matter in contains) directly influences its size, temperature, and luminosity, or rate of energy output (brightness). The more massive a star is, the stronger its gravity. Mass therefore determines how strong the gravitational force is at every point within the star. This in turn dictates how fast the star has to consume its fuel to keep its gas hot enough to maintain stability everywhere inside it. This controls the temperature structure of the star and the methods by which energy is transported from the core to the surface. It even controls the star's lifetime, since the rate of fuel consumption determines lifetime. The smallest stars are about 0.08 times the mass of the Sun. If a ball of gas is any smaller than that, its internal temperature will not be high enough to ignite the necessary fusion reactions in its core. It would instead be a brown dwarf, a small, dark, cool ball of dust and gas that never quite becomes a star. The largest stars are about 50 times more massive than the Sun. A star more massive than that would shine so intensely that its radiation would start to overcome gravity; the star would shed mass from its surface so quickly that it could never be stable. All stars eventually exhaust their hydrogen fuel. At this point, the gas pressure within the star goes down and the star begins to contract under its own gravity. The fate awaiting a star at this point is determined by its mass. Buried deep inside the star is a hot, dense core, about the size of Earth. Helium left burning at the core eventually ejects the star's atmosphere, which floats off into space as a planetary nebula (a cloud of gas and dust). The remaining glowing core is called a white dwarf. Like a dying ember in a campfire, it will gradually cool off and fade into blackness. Space is littered with such dead suns. A star up to three times the mass of the Sun explodes in a supernova, shedding much of its mass. Any remaining matter of such a star ends up as a densely packed neutron star or pulsar, a rapidly rotating neutron star that emits varying radio waves at precise intervals. A star more than three times the mass of the Sun will also explode in a supernova. Its remaining mass becomes so concentrated that it shrinks to an indefinitely small size and its gravity becomes completely over-powering. This single point in space where pressure and density are infinite is called a black hole. Excellent and very well presented . Can mankind produce energy from thermonuclear fusion or is it just a scientific dream ? So far the Russion Tokomac has not been successful. Will it ever produce enough energy to sustain the plasma and release some ?